Toulouse Lautrec, 1864-1901, one of France’s famous artists in art history and one of the last of the Impressionists gained his greatest collection of subject matter for his paintings in the Moulin Rouge, a dance hall where intellectual and flotsam of bohemia congregated side by side. The subject matter of his artwork ran across the spectrum of life, dancers, singers, actors, circus performers, prostitutes, noblemen, theatres, cafes, restaurants, and the dregs of society. Toulouse Lautrec painted one of his famous paintings "The Salon in the Rue des Moulins", in 1894, a brothel that he frequented often. A keen observer, the scene is in the reception room, the madam trim and proper is surrounded by bored prostitutes displaying sagging postures and empty meaningless lives. As draftsman, more than a painter, Degas and Ingres influenced Lautrec’s art. Ingres encouraged Degas to draw lines, many lines executing artwork. Some of Lautrec’s artwork is layered, and one can see directly through to the first lay-in, and in other artwork we can see down to the bare canvas. Other areas are scrubbed then overlayed with loose linear lines, indicating a fascination with experimentation and originality. Toulouse Lautrec, painted another of his paintings "Au Moulin Rouge" in 1892. As Degas, he sets the viewer apart from the people seated at the table by a promenade where we view the personages unnoticed. The obtuse angle of the composition makes the viewer feel he is viewing the scene in the same manner as Lautrec himself. The original painting did not include the woman on the right edge. Canvas was added to accomadate the add-on and then canvas was added across the bottom for compositional balance. The woman's face is a bizarre mask-like quality colored green and yellow/white, sharply contrasted with red lipstick and orangey hair, a comment on part of the world in which he lived. Lautrec's contribution to lithography was experimentation. He sometimes applied brush- spattered speckles, and in other artwork used a combination lithographic crayon with lithographic wash. The experimental process brought a quality to lithography characteristic of his famous paintings, the immediacy of painting. Toulouse Lautrec’s lithographic art posters in art history were influenced by the linear, simplistic, ornamental quality of Japanese prints. Japanese prints were created to give enjoyment over a period of time where posters were meant to advertise and entertain in a short period of time. The foremost objective was advertising, so the two-dimensional lettering restricted the dimensions of the complimentary pictorial art to only two dimensions as well. Other famous artists of Impressionism are Mary Cassat and Camille Pissarro. 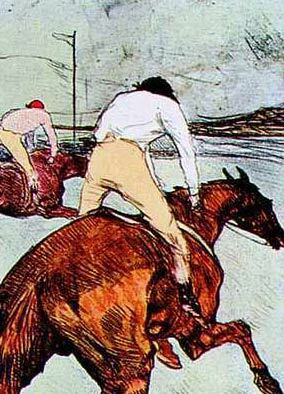 To view gallery 1, posters and paintings, by Toulouse-Lautrec, click here. To view gallery 2, paintings, click here.